Take a look at this screen shot. This game is 21 years old as of 2003 and I remember so much big hype about it back them. Radio commercials. Can you imagine a commercial for an arcade game? I have been thinking about this for a while now trying to remember why this was such a big game. What was the "big thing" about this that made it so different. I have always looked back and compared this with Raiden as one of the original vertical scrolling shooters. But then I did a little math with the copyright dates. Raiden was 1990. 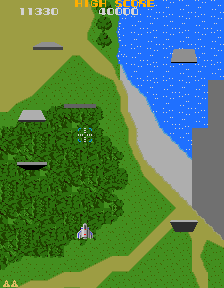 Xevious was 1982. Checking back through MAME ROMs finally brought the answer. Look at the background. What looks so commonplace today was the first incredibly detailed background for a video game. No star map or random color or isometric lines. A real background. Not a repeating one like Zaxxon. But a highly detailed terrain map. Then I remembered something I wrote about Satan's Hollow. About the background. Compare the two from 1 year apart. That was what made Xevious one of the milestone games. Xevious Fans like the annoying background music.